Fat Dog was established in 2011 by Jay Baker, Bob Boeri, and Alex Boeri, friends and LOng-time co-workers living on the Massachusetts North Shore. The founders of Fat Dog (and their families) have two primary objectives. 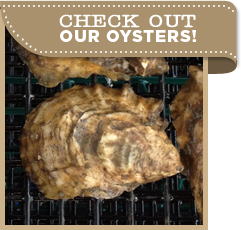 First we are a bit obsessed with figuring out how to consistently grow the hgihest quality oysters on our farm in New Hampshire’s spectacular Great Bay. Second, we consider ourselves to be stewards of the bay and want to grow our oysters in a way that protects and even improves the quality of the waters we farm. Perhaps the greatest part of oyster farming, though, is that we can pursue these goals while spending our days on the water —a pretty great way to make a living.